I have a thing about soap; in fact, I may write a future blog post about my love of soap in general. 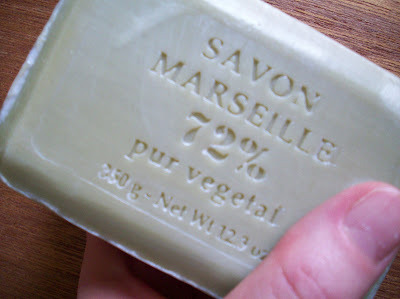 But today I want to talk about a particular kind of soap - castile soap, also know by the French name "savon de Marseille" (which means "Marseille soap"). 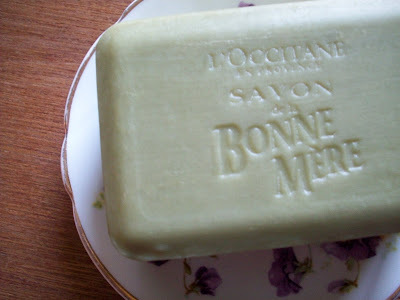 Castile soap was traditionally made with olive oil, although Marseille soaps eventually came to be made with either olive oil (which produces a green soap) or palm oil (which produces a cream-coloured soap). You can still buy castile soap today, and it usually comes stamped with the oil content (below). Castile soap is made throughout the Mediterranean region, but the soap made in the Marseille region of France is one of the most well-known. Marseille soap will be stamped with the word "Marseille." I bought this soap yesterday at L'Occitane, a French chain of soap and body care stores. I'm using this soap in my kitchen, of all places. It makes a great dish soap if you rub the dishcloth on it, then wipe the greasy dishes. This soap is scented with lavender, but I also love the smell of pure olive oil soap without any scent - it's subtle and earthy, and makes me feel virtuous. I love my BlackBerry. If you'd told me six months ago that I would get a BlackBerry (and that I would come to feel that I couldn't live without it), I would have told you you were crazy. I thought I knew myself well. I thought I knew what helped keep me organized, and what would drive me crazy. Turns out I was wrong. I'm a very visual person, and I like to see everything laid out in front of me. (In an organized fashion, of course.) Don't give me directions; give me a map. Don't tell me something; write it down for me. Don't hide my schedule in binary code; give me some paper and a pencil, already. Why do I love my BlackBerry so much? It does so much - all in one tiny little package. It can SEND e-mails. (IT CAN *SEND* E-MAILS!!!) How ridiculous is that? Someone needs a two-word reply on the fly? No problem! 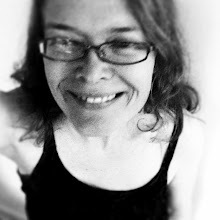 I have (dare I say this) responded to e-mails from just about anywhere: the grocery store, the health food store, restaurants, my car (no, I wasn't driving at the time, officer), my bed in the middle of the night, and the while using the toilet. It has a web browser. I know cell phones have been able to browse for years, but this is the first time I've had a mobile plan with browsing. Brainerd and I were at a choral management conference a couple of weekends ago, and during a session on strategic planning we were able to view, right there and then, the vision and mission statements posted on the Chorale's website, and discuss some changes we needed to make to them. It's a PDA (Personal Digital Assistant). One of my favorite features (oh, who am I kidding - they're all favorite features) is the address book, because - get this - you can click on someone's name and have the choice of phoning them (at any of their million locations), texting them, messaging them (Blackberry has its own messenger service between users) or e-mailing them. And like all PDAs, it also has a calendar/datebook and assorted sundry functions (calculator, etc.). It's a clock - and an alarm clock. My watch stopped working a couple of months ago. I haven't noticed. The BlackBerry is with me everywhere, so I always know what time it is. I only wish that it also had a timer. I mean, the alarm is kind of like a timer, except it's not. You have to set a clock time, as opposed to an elapsed time. 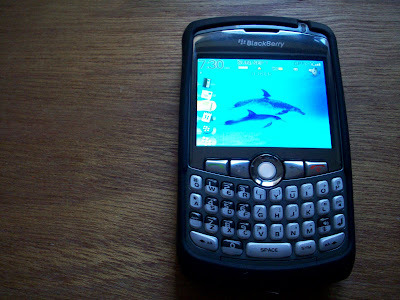 Here's my advice to the BlackBerry people: BlackBerry people, make a BlackBerry with a proper timer. I love the ring I've set for the alarm, though - it's called ChiGong: a gentle, Tibetan bowl sound. And my ringtone for incoming calls is equally soothing - it sounds like a single chord played on a harpsichord. It's a GPS (Global Positioning System). Took me a while to figure out how to navigate the map functions, but I still get a kick out of the device telling me exactly where I am at any given moment. Brainerd and I took a research trip to Cape Croker, ON (near Wiarton) last spring, and when we got lost on the winding country roads in the Native reserve, it could tell us exactly where we were. Sweet. The GPS can't give you directions to brand new addresses, however - which I discovered to my dismay when trying to find a friend's house in a brand new subdivision north of Toronto. 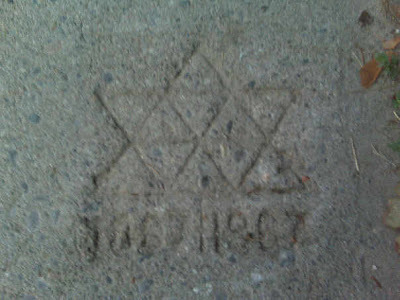 Might not have helped me much, anyhow: the houses were so new they didn't even have street numbers on them, yet. My number one favorite reason I love my BlackBerry, however, is that I can create lists on it. Like shopping lists, and To Do lists, and lists of my favorite inspirational quotes. I currently have 29 lists on my BlackBerry, and I add more every week. No more paper lists that I can never keep track of! I always have my BlackBerry with me, so I always have all my lists. I consult them constantly throughout the day, and especially when I'm shopping or packing for trips. My CrackBerry definitely feeds my list addiction.